Vendor space is almost full for the Nov 23-24, 2019 show. Don't delay! WHAT DOES A SPACE LOOK LIKE? To become a seller in the Allentown sales, fill out the form below. You will then be directed to the application! regarding Everything But The Garage Sales, Super Gigantic Garage Sales & Everything But The Garage, LLC. Complete form below to download application. ​Time to get organized! Make CA$H from your stash! Ag Hall Allentown Fairgrounds in Allentown, Pennsylvania! 8' X 13' Spaces Available for residential sellers, starting at $80. Residential, Commercial & Sponsorship spaces have different levels of pricing. Download application for full price list. ​If you wish to purchase more than one space, they will be placed side by side. Price is both days of selling. Spaces do not include tables or chairs. You may bring your own or may rent them when you complete your application. An indoor sale with heat / air conditioning. 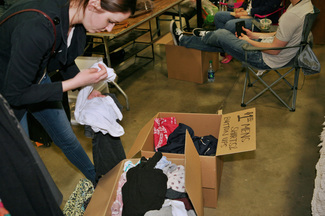 A Charitable Organization is scheduled to be on hand to take what you don't sell & what you don't want to take with you. Click here for the Rules of what items Goodwill can accept. Tax receipts will be provided. Concessions available for purchase during sale hours. Download & review the sale rules & regulations and application form by completing the form on the right. Complete the application with amount of space requesting and order any additional items needed. Submit completed application with full non-refundable payment. Additional information with regards to move-in / move-out instructions and sale regulations will be sent closer to the sale. If you want to effectively SELL or BRAND your products to thousands of people at a single time, becoming a vendor at our Garage Sales is one of the best decisions you can make. Our shows offer the ultimate selling and marketing platform. Goodwill will Be collecting Unsold and or Unwanted Items at the end of the Sale.